I found out a friend was ill over the weekend and while she wouldn’t let me bring her dinner, I had to send something over! 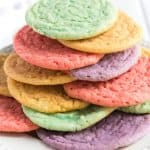 I decided to make her these sweet and cheerful KoolAid cookies. My boys loved helping me with the colors and I’m hoping they bring a little smile to my friend when she receives them! In a mixer cream together butter and sugar. Add flour to butter mixture 1/2 cup at a time and mix well. If you would like more than flavor of cookies divide your dough into separate bowls now. I divided my dough into four equal portions and used one half packet of Kool-Aid per portion. 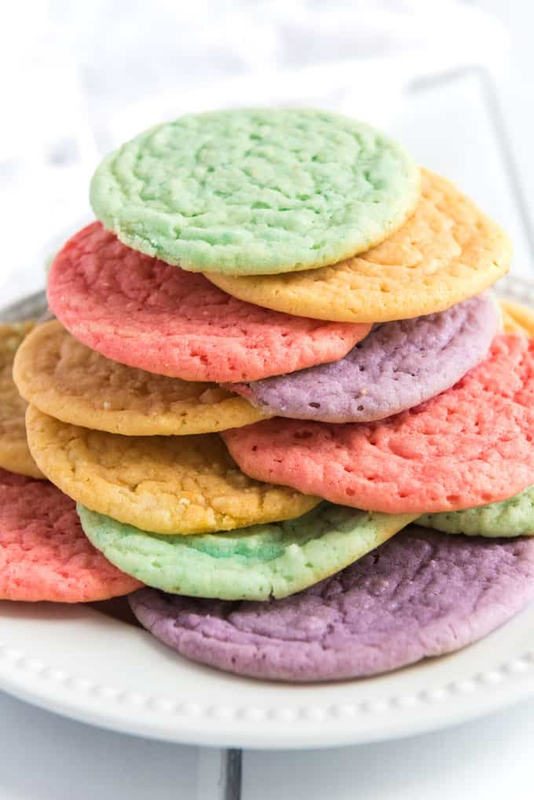 If you are making only two colors you will use one packet of Kool-Aid per half, if you only want one color use two packets for the entire recipe. Mix Kool-Aid into dough until well blended and color is even. Drop by rounded spoonfuls onto greased cookie sheet and bake 10-12 minutes. Let cool one minute before removing from pan. Do they actually taste like the flavor you are adding to them? Does it taste GOOD?